Village signs is a new series of caches based on the ornate signs that depict the heritage, history and culture of the villages that put them up (normally on the village green!). 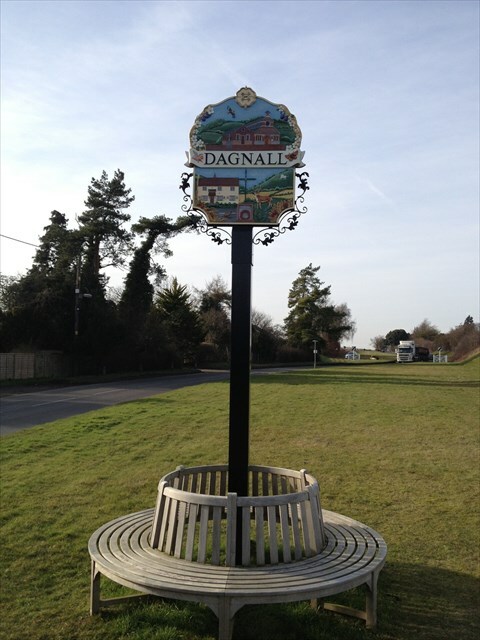 Dagnall is a village in the parish of Edlesborough Northall and Dagnall, in Buckinghamshire, England. The place name is derived from the Old English for "Daegga's Knoll". In manorial rolls of 1196 it was listed as Dagenhale. The spelling Dagenhale appears in a legal record of 1450. Thomas Bradwater is listed as a husbandman of the place. Unveiled 3rd December 2011 by local the MP the seat and sign are part of the EDaN (Edlesborough, Dagnall and Northall) Beautification project. The seat is dedicated to the memory of villagers Anne Thompson and Michael Price. The cache is a tube type covered in green tape hidden close by!